As part of our commitment to keep children safe, Breakstone, White & Gluck donated bicycle helmets to several schools and safety programs during our 2016 Project KidSafe campaign. We made donations to schools in the Boston area and across the state. 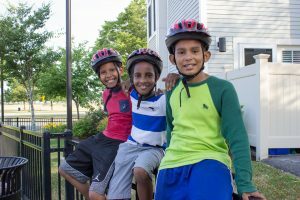 We made our largest donation of 400 helmets to Massachusetts Safe Routes to School, which works with schools, communities, students and families to increase biking and walking among elementary and middle school students. 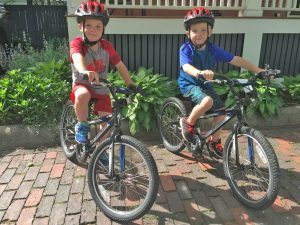 Safe Routes to School offers safety education and organizes bicycle rodeos in more than 50 percent of communities in Massachusetts. 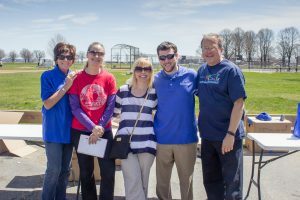 Left: Attorney White with Moss Lynch and Jana Linhart of Massachusetts Safe Routes to School, Maren Tober of South Boston Healthy Community Champions and Mary Picard Walsh from the South Boston Neighborhood House. Next: Attorney White helping a young cyclist. Next: Group shot of kids with Jana Linhart, Safe Routes to School outreach coordinator and Attorney White. Last: Young cyclist takes to the obstacle course. 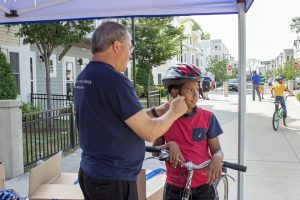 In Somerville, we donated 300 helmets to Somerville Public Schools and CYCLE Kids. The helmets were given to fifth graders who completed the CYCLE Kids curriculum as part of their physical education classes. 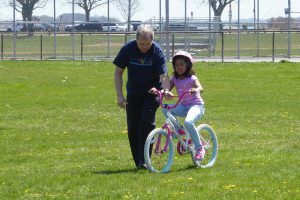 The curriculum teaches students how to ride a bicycle, bicycle safety and nutrition basics. This is the third year we have made this donation. 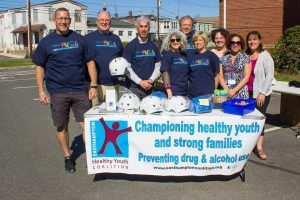 Attorney Marc L. Breakstone joined Somerville Police Officer Marianne Manfra, Physical Education Teacher Kris Savage in handing out the helmets to students at the Dr. Albert F. Argenziano School last June. Read our blog. In Arlington, we made a donation to the Arlington Public Schools for the third year. We donated 170 helmets to support the Walk to School Day events for elementary school students. 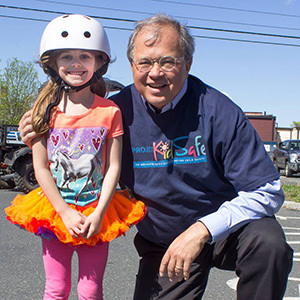 These events focus on encouraging children to safely walk and ride bicycles to school. 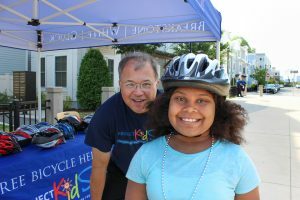 Our Project KidSafe bicycle helmets were donated to children who needed one during these events. 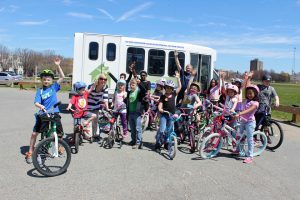 The donation was coordinated through the Arlington Bicycle Advisory Committee. Read our blog. 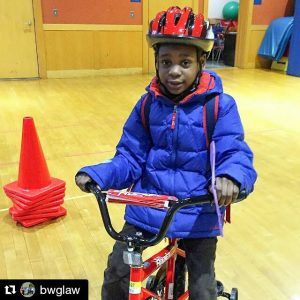 For the second year, Breakstone White & Gluck donated bicycle helmets to the Joseph M. Tierney Learning Center in South Boston. 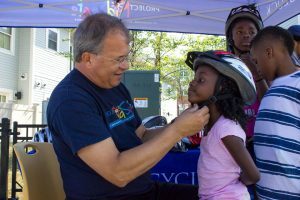 Attorney David W. White fit helmets for the children at the center’s summer party in July. 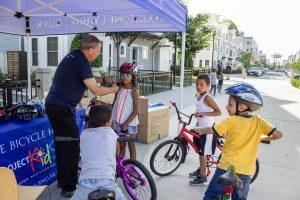 In Roxbury, we donated 75 helmets to the Haynes Early Education Center, which is part of the Boston public school system. 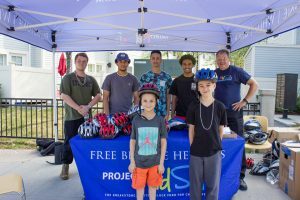 The school gave the helmets to children who needed one at its Healthy Families Event. Read our blog. Photos: Arlington Public Schools left, then the Haynes Early Education Center. 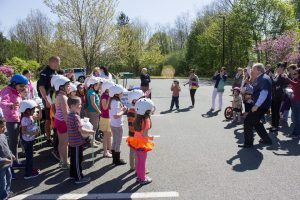 In Easthampton, we donated 140 bicycle helmets to children at the Event to Celebrate Bike Safety in May. 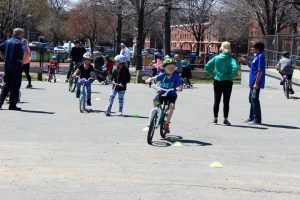 The event was sponsored by the Easthampton Healthy Youth Coalition, Easthampton Police, Easthampton Public Schools and the Northwestern District Attorney’s Office. 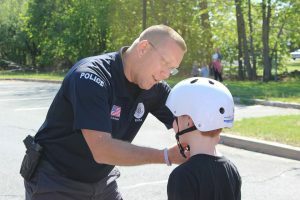 Attorney David W. White attended to help fit helmets for the children. Read our blog.